So this didn’t come out quite as pretty as I hoped – I felt that the base looked too dark. Maybe it would have been nicer on a yellow and white sponged base or even a green? I don’t know. I’ll try it again. 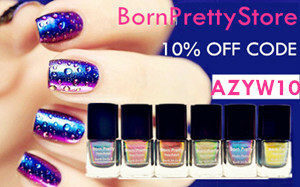 So after my previous reviews, BornPrettyStore gave me the opportunity again to pick a few more products to review. 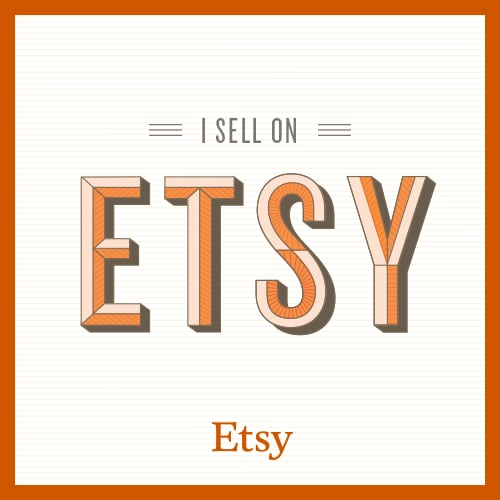 (I also placed a personal order which will hopefully arrive soon, including something I’m super excited about.) 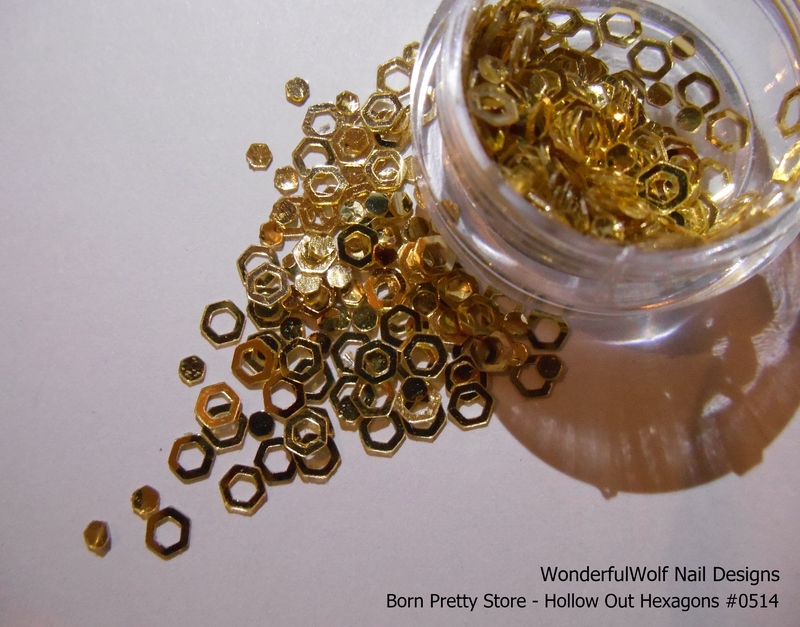 The first of the items that I chose were these Hollow Out Hexagons*. 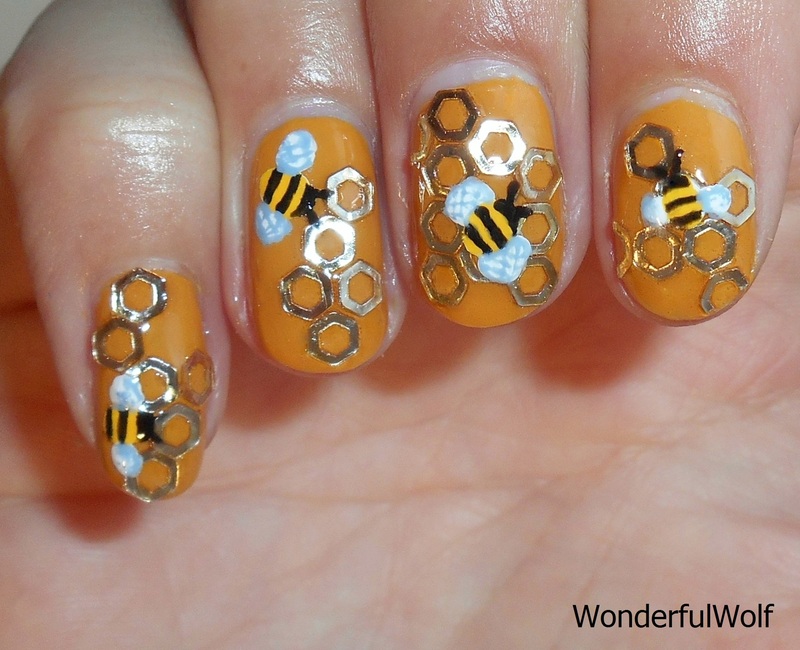 They are available in twelve colours, but when I saw colour #0514 I immediately knew what I was going to do with them, you could have probably guessed before seeing the results – a bees honeycomb! They come in a lovely little pot, keeping everything tidy. 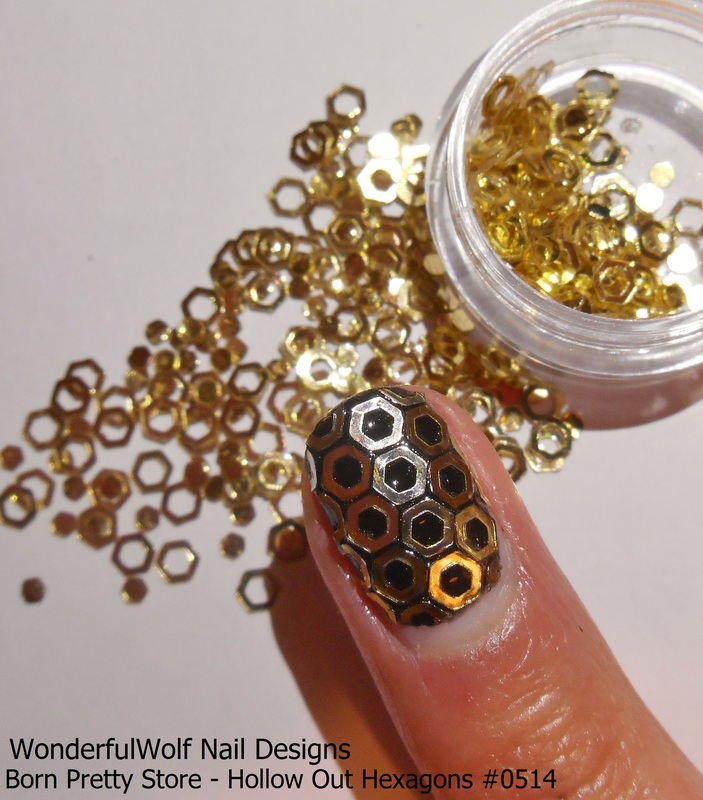 As well as the hexagons themselves, you get the little cut out sections too which is an added bonus and would be great for other glitter placement designs. With them being really thin, it was also easy to cut them. This meant I could trim them to the appropriate shape to continue the design to the edges of my nails. It just made the design look finished and a whole lot better! You guys know I love bugs and creepy crawlies right? I have animals, bug objects and wilderness in my house everywhere. 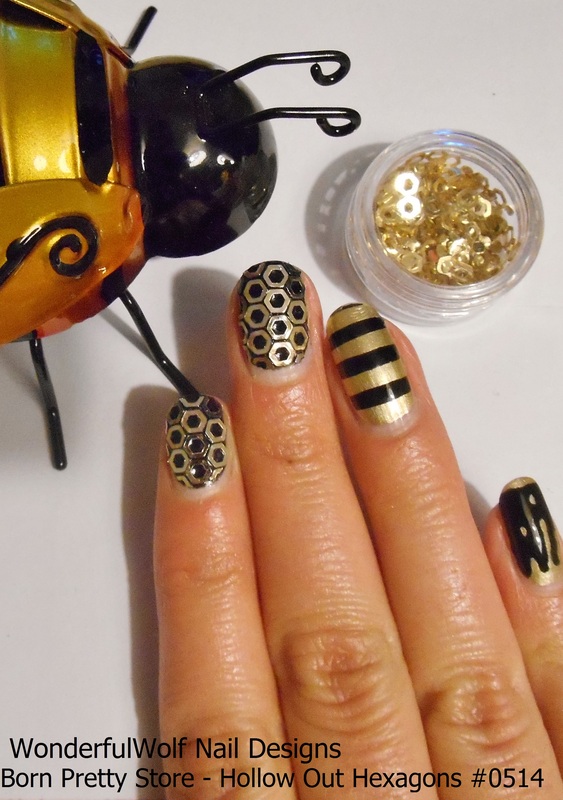 I couldn’t resist the opportunity to pose with this metal bumblebee who lives in my garden – it was the perfect mani to include him in! – Easy to cut meaning you can continue the design right up to the nail edge. 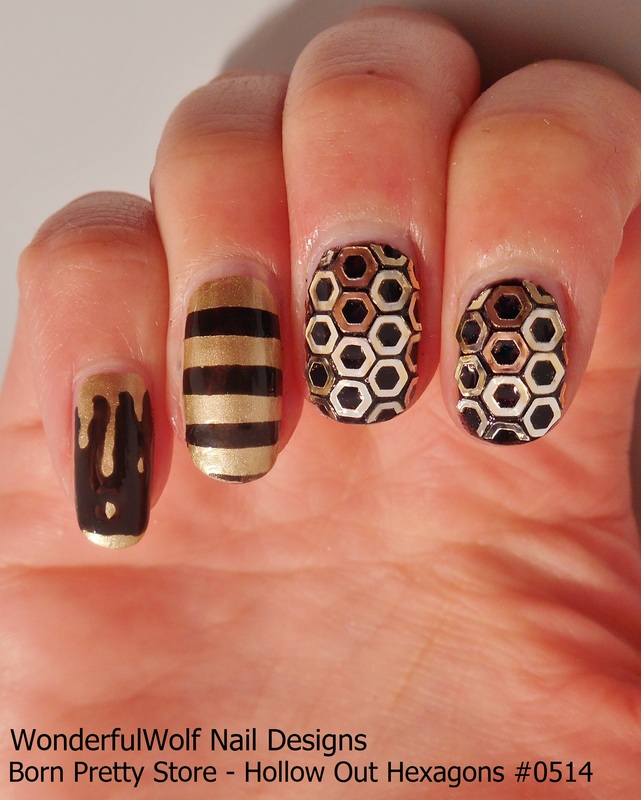 – The colour didn’t bleed from the hexagons with Seche Vite as the top coat, I’m not sure how other brands would fair though. – The cut out sections are included, meaning a little added bonus for your bucks. *This product was given to me for free for review.